← Do you spoon your cuppa? Anyone who knows me well will tell you I’m a nerd to the core of my soul, and one of the particular manifestations of that is my love of spreadsheets, graphs and numbers generally. One of the upsides to this bent is that BAS time is actually fun (I see that look you’re giving me). The other is that I tend to record data on my writing for later analysis and tracking. I’m planning a blog soon using the data I have from the five novel manuscripts I’ve written, but today I wanted to present a few insights about short stories, and more particularly, submitting them to markets. I’ve been fortunate to have some successes in the short story arena. I consider myself an emerging writer, but I’ve been tracking my short stories since I started trying to have them published. I find it essential – I can’t remember otherwise where they’ve gone, how long ago, and when to re-query. So today I’ve made a preliminary troll through the data and I present three insights that showed themselves. 1. How long does it take to get a response? Average time for my submissions is just over 6 weeks, but I tend to favour fast-responding markets and I try to match my submissions so I’m not wasting time sending things that market would never go for anyway. Anthologies and competitions take longer, because their reading periods are often months and I tend to submit early. If I remove the anthology and comp submissions, the average response time has been 4.5 weeks. The fastest responding markets (with average times) for me have been: (the aptly named) Lightspeed (3 days), Clarkesworld (5 days), Shimmer (6 days). A few markets have never responded. I have ignored these in my analysis as two have folded since. 2. What’s the success rate? After 70 submissions, I have 7 stories actually published (or in press). That’s 10% success rate. I have no idea if that’s good or not – I think perhaps it’s not too bad … it’s better than the acceptance rate for some academic journals. 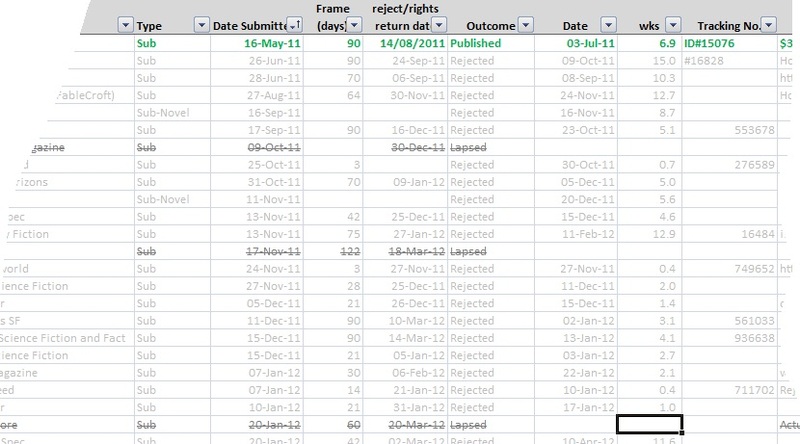 The fewest submissions before acceptance was 1 (one story was picked up by the first market I submitted it to). The most is currently on its 14th submission – it may yet have many more. The average is 5 subs per story; 4 if only counting those published. There’s two ways of looking at this. The first is: depressingly little. Only 3 of my 7 published stories earned me actual money, and the total is just a shade over $200. When you look at the number of hours invested, that’s really a negligible return. I’m early career though … it’s possible there may be more money in it in the future, but I suspect not that much more. I can remember a well-known sci-fi author at the last AussieCon saying that, during the sci-fi zine hey-day in the 60s and 70s, he could write two stories in a day and sell them both, which earned a fairly tidy income. I suspect those days are long over, even if I could write two stories a day. The other way of looking at it is investment. Time in craft, time in exposure, not to mention returning an awful lot of pride. I’ve had a few lovely comments come from readers, which was worth every revision-riddled minute. And one submission eventually published was solicited, which was immensely satisfying. Plus … there seems to be some kind of snowball effect happening – 5 of the 7 pubs have been in the last year. Posted on February 14, 2013, in Charlotte Nash, writing and tagged creative writing, publishing, short stories, statistics. Bookmark the permalink. 7 Comments. God I love your brain, Char!!! Ditto both sistas above!!! Your nerd-brain is so fascinating! Reblogged this on Charlotte Nash.